"Can a man and woman be just "friends"?" 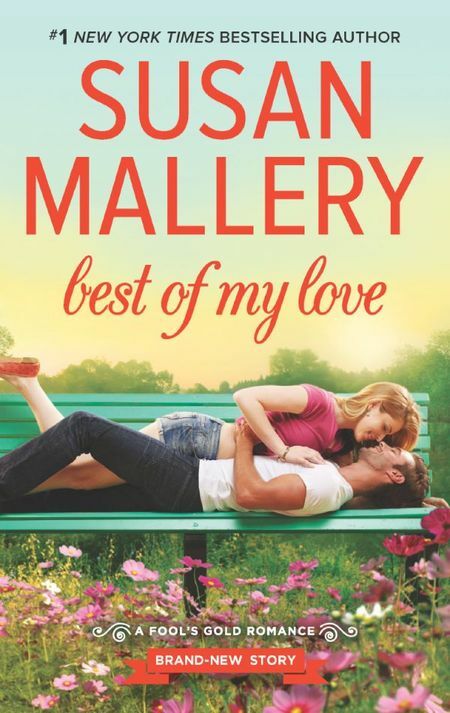 BEST OF MY LOVE is a continuation of The Fool's Gold Series by Susan Mallery that is the second story about the Mitchell brothers. Once again Mayor Marsha seems to know what is happening with everyone and always has the ability to intervene when needed. How she seems to know about everything is a mystery. The two octogenarian, Gladys and Eddie, are their usual spunky selves. BEST OF MY LOVE leads to the question of whether the opposite sexes can be just "friends." This is one of my favorite series that I enjoy because of all the different characters with varied personalities and personal situations. Shelby Gilmore is a baker who was rescued by Mayor Marsha from an abusive situation and moved to Fool's Gold. Because of her painful past Shelby finds it hard to trust men. In order to change her psyche Shelby decides to look for a "male friend". She chooses Aidan to be that friend. Aidan Mitchell runs Adventure Tours and has a reputation for bedding any willing female tourist. An incident shows Aidan that he only uses women. After that epiphany Aidan decides he wants to change. So when Shelby approaches him with the suggestion of having a "friends" only relationship he agrees to try it. I enjoyed seeing Shelby and Aidan go outside of their comfort zone. Being around Aidan helps Shelby to be more confident and branch out. Shelby helps Aidan to come in touch with his "feminine" side. Even though Shelby and Aidan continually tell family and friends they are just "friends", no one believes them. Are they trying to convince others or themselves? Shelby and Aidan became quite comfortable with each other. It was really funny how Aidan's brother reacts to how he has changed. I recommend BEST OF MY LOVE and any of the Fool's Gold Series because they are all about family situations that will make you laugh and sometimes cry. To overcome her painful past, baker Shelby Gilmore goes on the hunt for a friend�a male friend�to convince her stubborn psyche that men can be trusted. But where in a town as small as Fool's Gold will the petite blonde find a guy willing to not date her? Dark, charming Aidan Mitchell puts the "adventure" in Mitchell Adventure Tours�and into the beds of his many willing female tourists. Until he realizes he's inadvertently become that guy�the one-night Casanova�and worse, everyone in town knows it. Maybe Shelby's boy/girl experiment will help him see women as more than just conquests so he can change his ways and win back his self-respect.